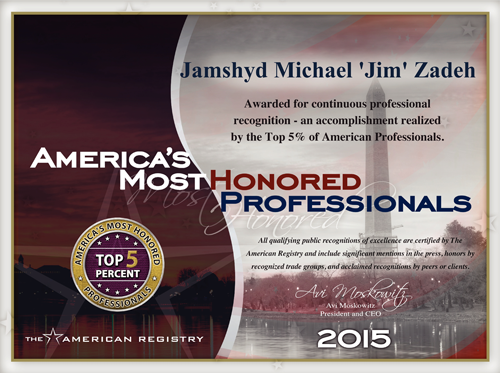 2015 America's Most Honored Professionals Award | Law Office of Jim Zadeh, P.C. ?Is It Illegal To Text And Drive? ?What Do I Do After a Car Accident? ?When are damages too speculative? Jim Zadeh has been given the 2015 America's Most Honored Professionals Award. This is awarded for continuous professional recognition - an accomplishment realized by the Top 5% of American Professionals. This recognition of excellence is certified by the American Registry and include significant mentions in the press, honors by recognized trade groups, and acclaimed recognition by peers or clients. Lawyers recognized for excellence have remarkable professional accomplishments, great peer evaluations and more. Over 1 million North American lawyers work in businesses, government, and privately in solo practices and firms, large and small. Of the small percentage of Lawyers who are very publicly recognized for excellence, just a handful been selected as a North American Top Attorney. Jim Zadeh is considered to be one of the best and has achieved this hard-earned recognition.